In honor of Election Day and the fact The Daily Cookie debuts tomorrow, I am revisiting Family Circle’s First Lady Cookie Recipe contest. Remember back in March when they put Michelle Obama’s White and Dark Chocolate Cookies up against Ann Romney’s Peanut Butter & M&M Cookies? I received an email recently saying Michelle Obama’s recipe won. However, having baked both cookies multiple times in the past few months, I’m going to have to say it’s a tie. If you haven’t made the cookies yet, keep in mind that the Obama recipe on FC’s website calls for 1 cup (2 sticks) of butter and 1 stick (which is one cup — Crisco stick are larger than butter sticks) of Butter Flavor Crisco. That’s like making the Toll House recipe as written, but throwing in an extra cup of fat. So based on the reports from people who made the recipe as written and got flat, crepe-like pancake cookies, I’m guessing the recipe should read 1 stick (1/2 cup) butter and ½ stick (1/2 cup) Butter Flavored Crisco. That’s how I’ve been making it, and with that little fix, they are awesome. The mixture of butter and shortening gives them just the right balance of butter flavor and crispy-edged shortening texture. 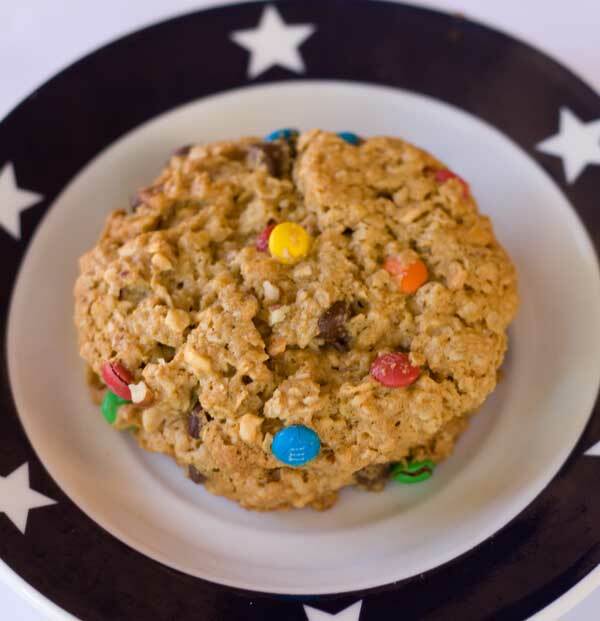 As for Ann Romney’s cookies, which are made with oats, peanut butter and candy and also go by the name “Monsters”, they are great and I’ve made them about a zillion times since the recipe was posted. 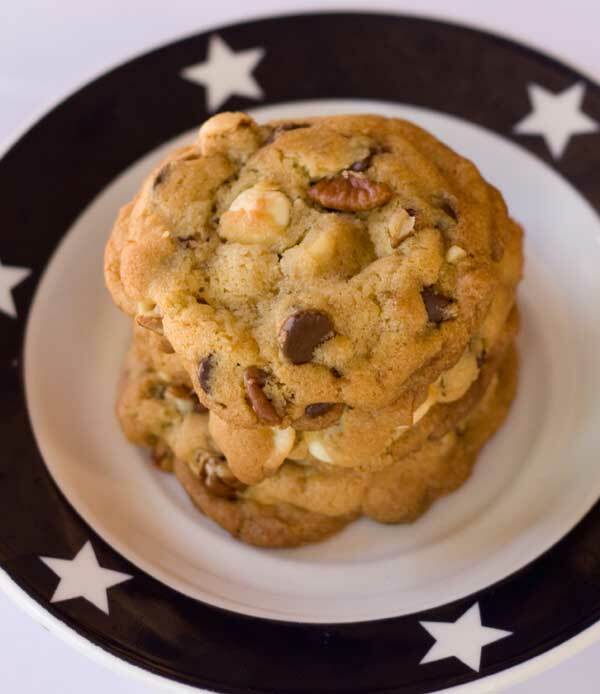 So if you haven’t made either of these cookie recipes yet and are looking for an Election Day stress reliever, try both. Maybe you’ll sway an undecided voter. Preheat the oven to 375°. Have ready two ungreased baking sheets. Mix the flour, baking soda and salt together in a small bowl. Using medium-high speed of an electric mixer, beat the butter, vegetable shortening, granulated sugar, and brown sugar until creamy. Beat in the vanilla extract. Reduce mixer speed to medium and beat in the eggs, beating just until mixed. By hand, stir in the flour mixture. When flour mixture is incorporated, stir in chips and nuts. Drop rounded tablespoons of dough onto baking sheets. Bake at 375° for 10 to 12 minutes or until golden brown. Cool on baking sheets for 5 minutes; remove to wire racks to cool completely. The original recipe says it makes 60 cookies, but I make mine slightly larger and get around 48. Preheat oven to 325 degrees F. Line two baking sheets with nonstick foil or parchment paper. In a large bowl, using an electric mixer, beat sugars, butter, peanut butter and corn syrup on high speed until creamy. Beat in eggs 1 at a time. Beat in vanilla extract. In a separate bowl, mix together oats and baking soda. Stir into peanut butter mixture until combined. Mix in chocolate chips and M&M's. Using about a 1/4 cup measure, drop dough onto baking sheets (about 9 per sheet). Press tops down slightly. Bake at 325 degrees F for 18 minutes or until lightly browned. Cool 2 minutes, then transfer cookies to a wire rack to cool completely. I can’t seem to find the EXTRA dark chips in my area, just the regular, special dark ones. Darnit. Just got my book at work this morning so I haven’t had time to do more than flip, but I really love all the creative indexes in the back. That’s going to be so handy! Also, thumbs up to the comment where you mentioned you usually eat two kinds of cookies at once! Anna got your book yesterday–my son ordered it from Amazon for my Oct birthday. Really like it! He was even impressed. Think I’m going to pick one or two recipes in the month to do! Congrats on a great first book! Congratulations!! I love the cookbook so much. Joan, if you have time, let us know which cookie wins in your office. About mint chips, they’re okay if all you plan on eating is mint, but I usually eat two kinds of cookies at once and hate it when the mint flavor takes over. I just used white chips and dark. Hi Anna, Thanks for saving my batch of Obama cookies. I was very skeptical when I saw all that fat in the recipe. I made both recipes tonight. I’m going to bring them to the office and have people vote for their favorites, without telling them whose recipe is whose. Also, I noticed that you left out the mint chips from the original Obama recipe. Was that intentional? I followed your recipe: the mint chips sounded a little weird to me. I would need to go with Michelle’s cookie because I’m not a peanut butter in cookies fan. I too am afraid of shortening, but I may pick some up JUST for cookies. Also, I didn’t win Katrina’s give-away so it is off to Amazon to purchase The Daily Cookie! I agree that the responsibility of picking the winner would be rather daunting–people are so passionate about food and so partisan about politics, I imagine things get very heated! But one thing I love about this cookie contest is that of the recipes I’ve seen over the years, I can’t think of one that really sounded bad, Democrat or Republican. It’s kind of heartening to think that I could still say, if I met Ann: “you know, we disagree on many issues, but we can at least agree that peanut butter in cookies is pretty awesome.” I feel sorry that Michelle’s otherwise great recipe had a typo in it, though, when it was originally printed. I need to get over my fear of shortening and I want to try the Monsters although I’m tempted to use peanut butter M&Ms. Yum! Both cookies look great. Hope, I’ll be curious to hear how the Brazilian versions of American First Lady cookies work. It’s interesting to get feedback on how ingredients vary in different countries. You’d think flour would be flour and butter would be butter, but there are sometimes differences. Karen, I find the butter flavoring in BFC a little strong. I do like it in the Obama cookies because only half the usual amount is used and it adds a nice backdrop flavor. However, regular shortening works just fine. I would have hated to have been on the Family Circle’s judging team. I really like both types of cookies! But my favorite would still have to be…. Dang it, it’s a tie. LOL. I’m looking forward to trying both recipes out. I don’t have butter flavored Crisco, so it will be interesting to see if that makes much difference in the Obama recipe. Amazon says my copy won’t arrive till the 13th at the earliest… and I can’t wait! Since I live in Brazil I did not know about this cookie “competition”. I look forward to trying them both. Thanks for this topical post! I have to say that as there are more non-peanut eaters in my family, Obama recipe will probably win in my household! Also, I’ve been following your blog for a few years now and I am so happy to hear about your cookbook! Waiting for tomorrow with baited breath. And the winner of my Daily Cookie book giveaway has been notified and will get the book shipped tomorrow! Hooray! Thanks for ordering, Corinne. I hope it arrives at your house early this week. Cheryl, have you ever made your recipe with all butter vs. the butter shortening mix? If so, I’ll bet you could tell the difference in texture. I don’t recommend using shortening for ALL chocolate chip cookie recipes because some versions, depending on ratios, are great with 100% butter. However, recipes using the Toll House ratios (or close to) really seem better with 1/2 shortening. I have always made my CC cookies with half butter and half butter Crisco. I like the flavor and the way they set up. I make a small recipe using 1/4 c butter, 1/4 cup Crisco, 1/3 cup each brown and white sugar, 1 cup 1 T flour and 1/2 teaspoon each of baking soda and vanilla. Makes about 22-24 small cookies. Well, as I don’t eat nuts but like M&Ms, I’m with Ann on this one. Tomorrow’s a different story.